OAKLAND — Former Your Black Muslim Bakery leader Yusuf Bey IV — who a prosecutor said terrorized Oakland — was convicted Thursday of three counts of murder for ordering journalist Chauncey Bailey and two other men killed in summer 2007. Bey IV’s co-defendant, Antoine Mackey, was convicted of helping confessed killer Devaughndre Broussard hunt down Bailey and also of killing another man, Michael Wills. 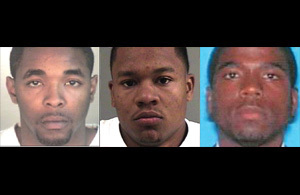 The jury deadlocked on whether Mackey helped Broussard kill the third victim, Odell Roberson. Bey IV and Mackey, both 25, face life in prison without possibility of parole. Judge Thomas Reardon has scheduled sentencing for July 8. Defense lawyers are promising appeals. Bey IV, in a dark suit and trademark bow tie of his Black Muslim faith, stared straight ahead as the verdict was read. Mackey stared at the ceiling. The jury of seven women and five men began deliberations May 23 after nine weeks of testimony from more than 60 witnesses. Bailey, editor of the Oakland Post, was gunned down Aug. 2, 2007, on his way to work in downtown Oakland. Broussard told officials that Bey IV ordered the death to stop the journalist from publishing an article about the bakery’s financial troubles. Broussard, 23, accepted a plea deal in exchange for his testimony and is expected to be sentenced to 25 years in prison. Bailey, 57, was the first journalist killed over a domestic story in the United States since 1976, when Don Bolles of The Arizona Republic died in a car bombing. After Bailey’s death, a coalition of local media, including the Bay Area News Group and KTVU-TV, joined in the Chauncey Bailey Project, an investigative group that looked into the case and the Oakland Police Department’s handling of it. After a decade-long stint at the Detroit News, Bailey joined the Oakland Tribune in 1993 and was fired from the paper in 2005 for ethical violations. He had been appointed editor of the Oakland Post, a free circulation weekly paper covering the city’s African-American community, only weeks before his death. He had written but not published a story about the bakery’s 2006 bankruptcy filing that a judge had recently converted from reorganization to liquidation. Post Publisher Paul Cobb had rejected the story, claiming it didn’t contain enough attribution. At the time, police suspected bakery members were involved in two other killings as well as the kidnapping of two women and the torture of one of them. Police had planned to raid the bakery compound the day before Bailey’s murder, but delayed to accommodate the vacation scheduled of two senior SWAT commanders. When they carried out the operation the day after Bailey’s death, Broussard threw the shotgun out his bedroom window and was arrested. He repeatedly told police he didn’t kill Bailey, but Bey IV, in separate interviews with detectives, claimed Broussard had told him he committed the murder. Broussard told jurors during his trial testimony that Bey IV convinced him to give a flawed confession. “He said I was being tested by God,” Broussard said that he was also promised a Bey-family lawyer, money and a light jail sentence in exchange for protecting Bey IV from charges he ordered the killing. Police said within days that they didn’t believe Broussard acted alone, but did not investigate other suspects vigorously. Bey IV and Mackey were not charged in Bailey’s killing until April 2009, after Broussard agreed to cooperate with prosecutors. During breaks in his testimony he often rocked back and forth in the witness chair and appeared to be muttering to himself with his eyes closed. Deputy District Attorney Melissa Krum said Broussard was far from the perfect witness, telling jurors he was a sociopath, but, in effect, was chosen by Bey IV, not her. I am so very pleased that it was decided to “open up” the Chauncey Bailey Project. As the purpose, as I understand, was to keep the Oakland Police Dept. “focused” in solving this case, and finding the perpetrators who actually collaborated and “pulled the trigger” in this heinous crime! I did not know Mr. Bailey professionally or personally, but after what happened to him, I was terribly upset! Where are we headed to, with this “young” African-American race who take “life for granted” because they want to “play” who is the man? As they poke their chest out and thump their chest showing they are “king of the jungle”! This Brother was writing a piece on the “Your Black Muslim Bakery” and because they did not like their name in public, they decide to “shotgun” the man in broad daylight? How crazy is that in todays society? If they do not like their name “out front” of the people of Oakland, then “run a clean operation”! Anyways, they were convicted today, but I’ll feel better when they are committed to LIFE in the state penn!